In the process of planning a recent trip to Europe, my decision making got tough when I reached the point to decide which airline to fly. The choice to airlines to Europe from New Zealand are endless. Thinking from a point fifteen years ago, there was predominantly limited choices and one had to choose (almost every time) to fly through Asia-Pacific through one of the Asian hubs. Decisions revolved around the shortest flight time to Frankfurt and so Los Angles to Frankfurt on Lufthansa was a natural choice. Flight time is 10H55M compared to 13H25M from Singapore. Lufthansa operates daily flights on the A380 from Los Angles to Frankfurt. Although offline, Lufthansa offers competitive fares from New Zealand to European destinations through it’s code share and Star Alliance partners. Business travellers have the flexibility of choosing a variety of stop over cities across Asia and America and using a Lufthansa connection over to Europe. 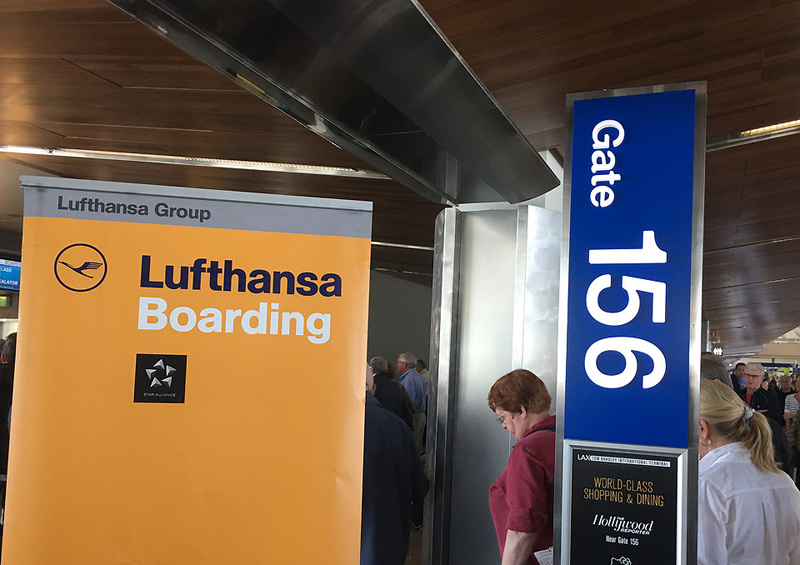 Lufthansa flights depart from Tom Bradley International Terminal at Los Angeles airport through check-in counters C 30 to C 45. There is no priority check-in for Premium Economy passengers. However, a humble request to the friendly staff and a mention that you’re flying Premium Economy should get you through priority check-in. 50kg total weight spread across a maximum of two bags. 2x115cm bags, each weighing up to 7kg, plus one additional item such as briefcase, handbag or overcoat. 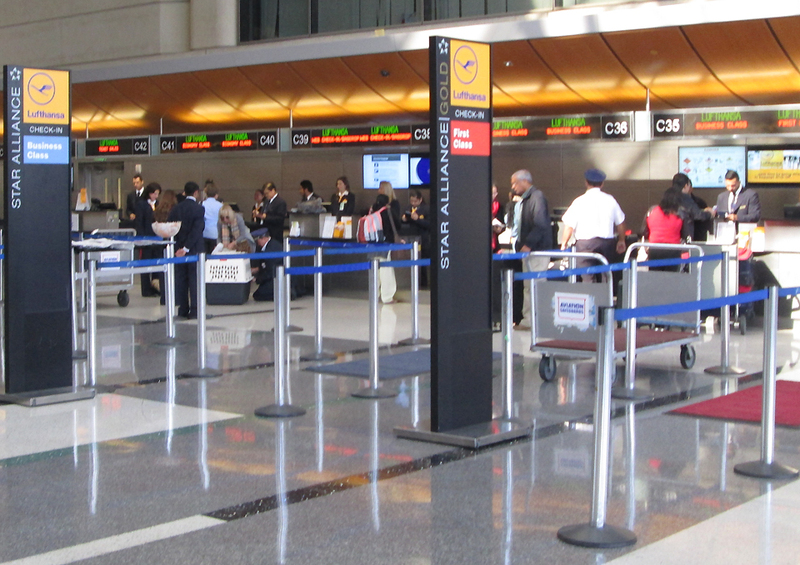 No fast track lanes for premium economy passengers at Los Angeles airport. 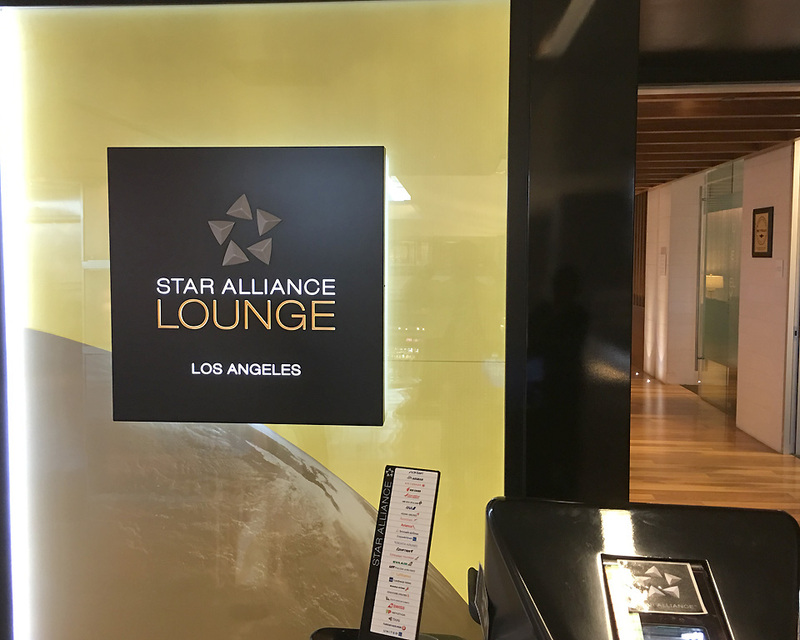 Lufthansa passengers can use the Star Alliance Business class lounge at Los Angeles Airport. However, Lufthansa doesn’t provide Star Alliance lounge access to Premium Economy passengers. 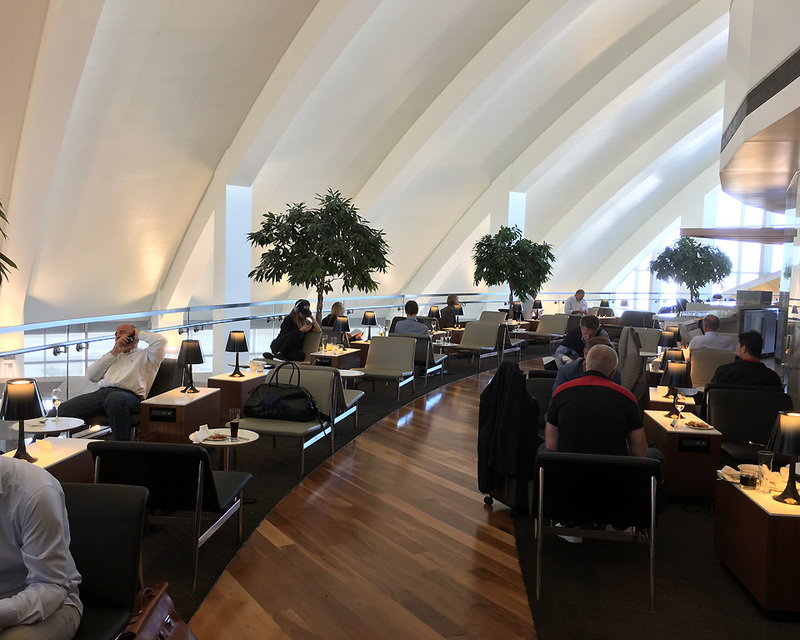 Access to Star Alliance Business class lounge can otherwise be accessed if you are a Star Gold customer or hold a paid lounge membership. Star alliance lounge is located just after the security through the clock tower elevator on the second floor. No priority boarding for Premium Economy passengers. However, as the Premium Economy cabin is on the lower deck of the A380 ano the front-end of the aircraft, boarding is through the front aero-bridge. That helps get into your seat a lot quicker specially during a full flight. On time departure at 1545 from runway 24L, a left 180 degree turn from over Santa Monica bay sets the course for Frankfurt. 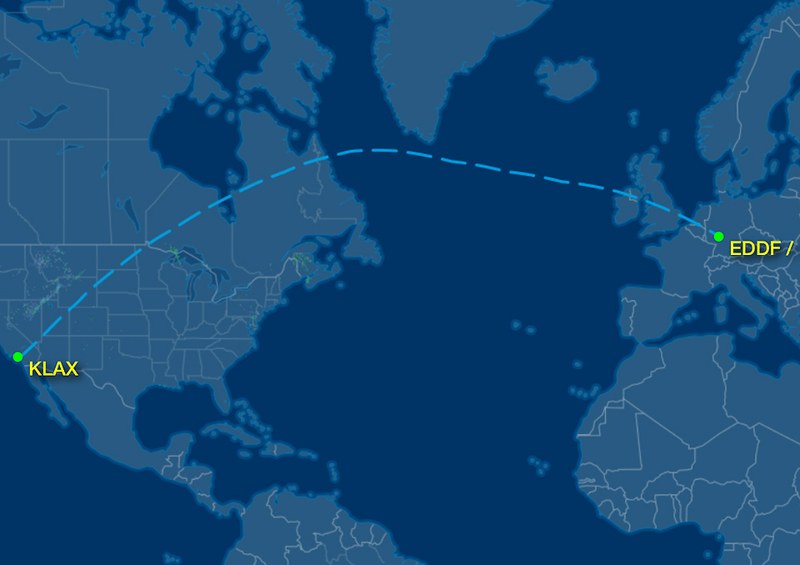 The flight crosses over to the eastern seaboard of America and over the Atlantic Ocean. Arrival into Frankfurt is at 1030 the next day. Premium Economy cabin on Lufthansa A380 is on the lower deck to the front of the aircraft. Rows 50-57, a total of 52 seats in a 2-4-2 layout. 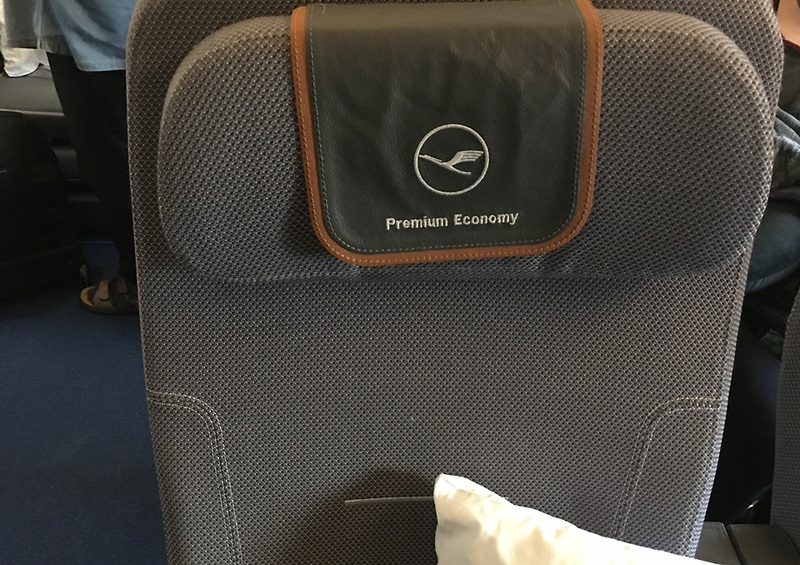 Lufthansa upgrade to the Premium Economy sector was the biggest in their history when they launched a new travel class first time in 35 years. But when they did, they introduced a truly unique product. 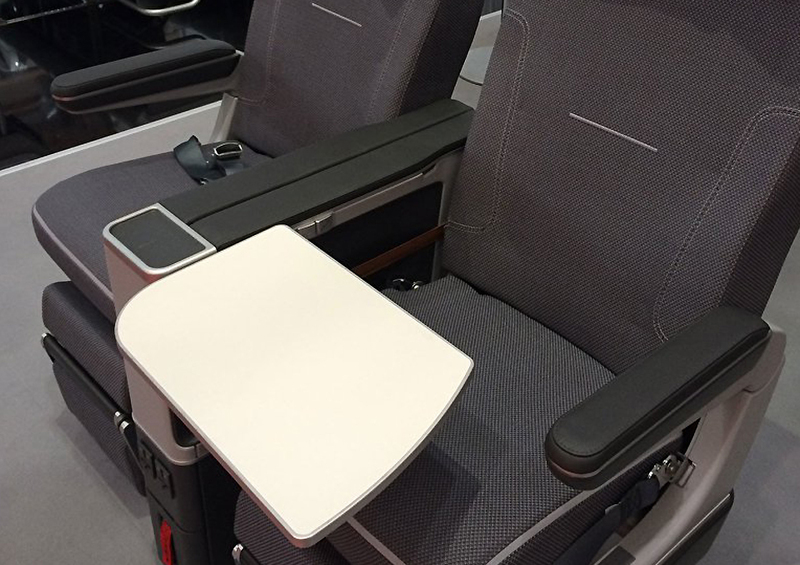 The seat is 1.2 inch (3cm) wider than the economy seat with a 38 inch (97 cm) pitch. The seat is incredibly comfortable and provides the much needed lumbar and side support that is much required on long haul flights. 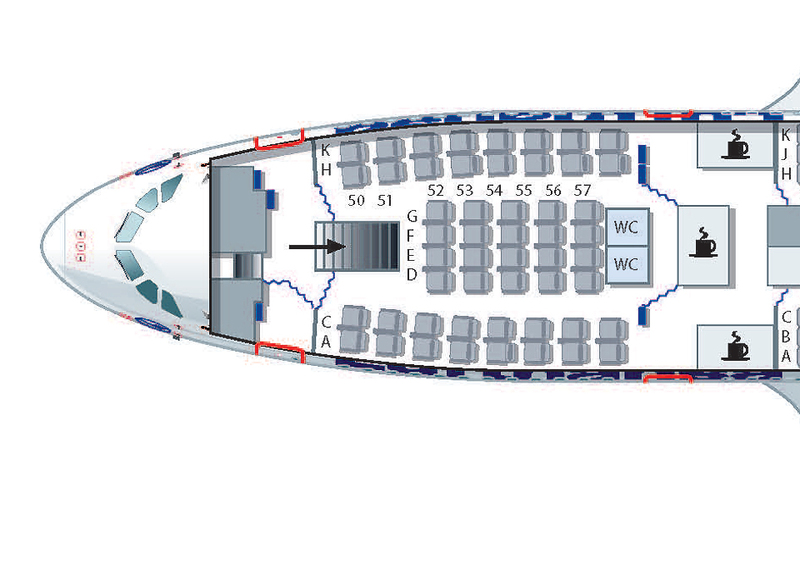 These seats make a substantial difference in the travel experience when compared to economy class. Front row seats sport a padded footrest that folds out in the front of the seat. The padding on the footrest combined with the seat pitched back adds further support to the calves. The wide and well-cushioned headrest allows for plenty of lateral movement. 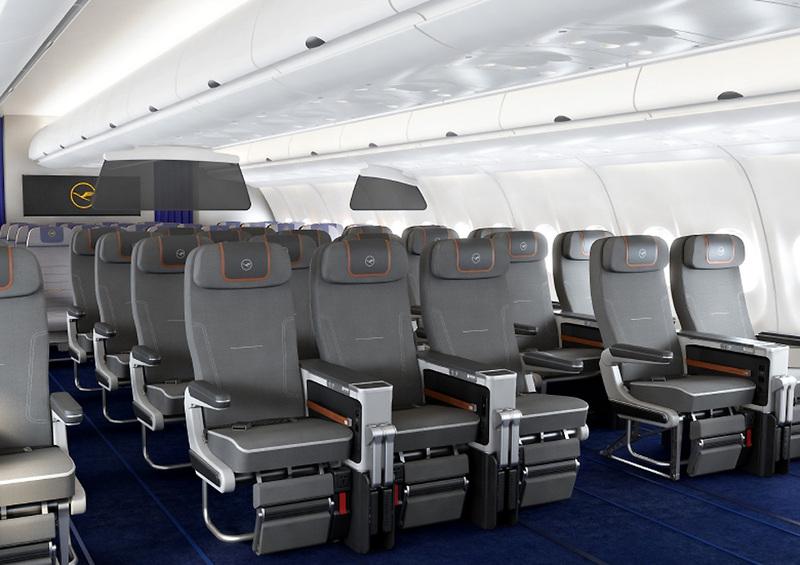 Each seat also packs in a multi-country AC charging port, a USB outlet for smartphones and tablets and a connection for powered noise-cancelling headphones. The fold-out tray-table is larger and sturdier and can fit full-size laptops rather than just tablets and ultra-books. The seat also flaunts double armrests ensuring there’s enough room for both travellers to get a fair share it on their seats. 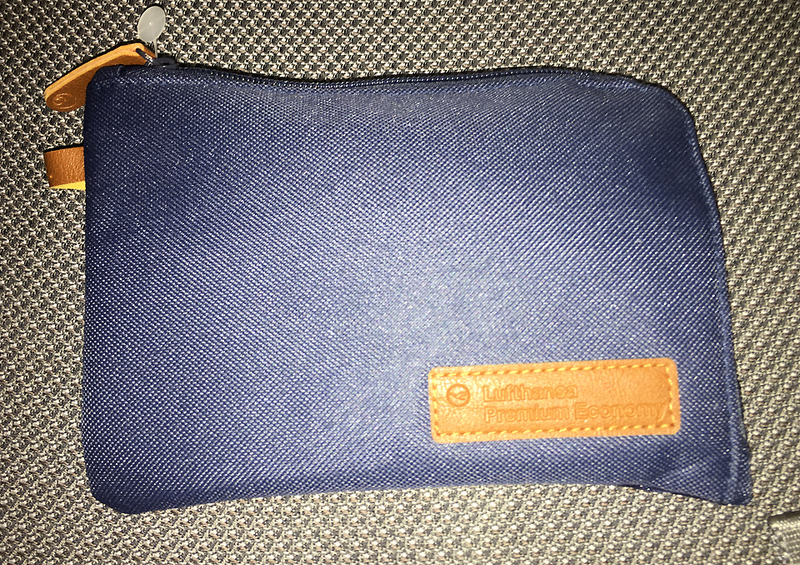 The handy Premium Economy amenity pouch contains essentials like a wet towel, socks, toothpaste and brush and ear plugs. A welcome beverage is served upon boarding. Apart from the bottle of water, the crew regularly do rounds of the cabin with a selection of juices and water to keep you hydrated throughout the flight. The food on board Premium Economy is similar to Economy except that its served in China and with stainless steel cutlery. The selection was good with a hearty serving of dessert. 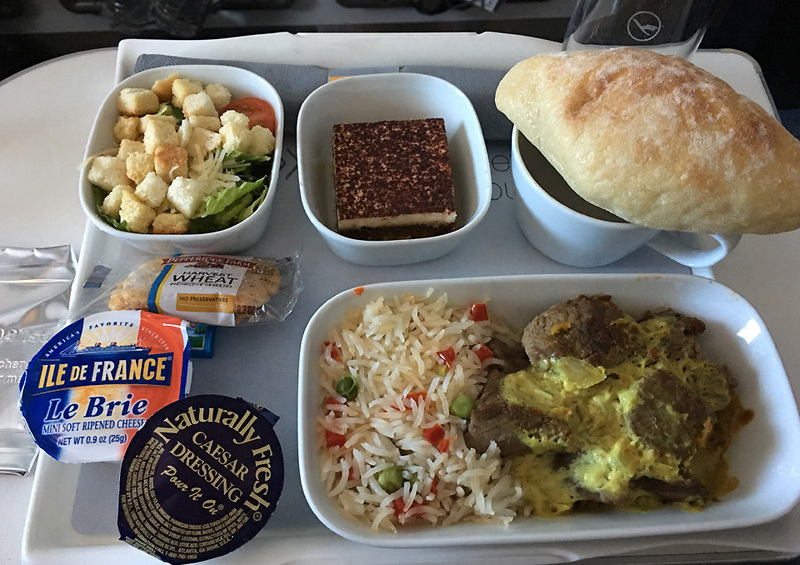 Crustons on the Ceasar salad were crunchy and didn’t taste of stale bread – something that I have noticed on most flights. The cesar dressing was fresh too. The curry on the Thai beef curry was too thick as the hot ovens would have over cooked it. But it tasted delightful. To accompany the meal there was a good selection of wines, spirits and beverages. 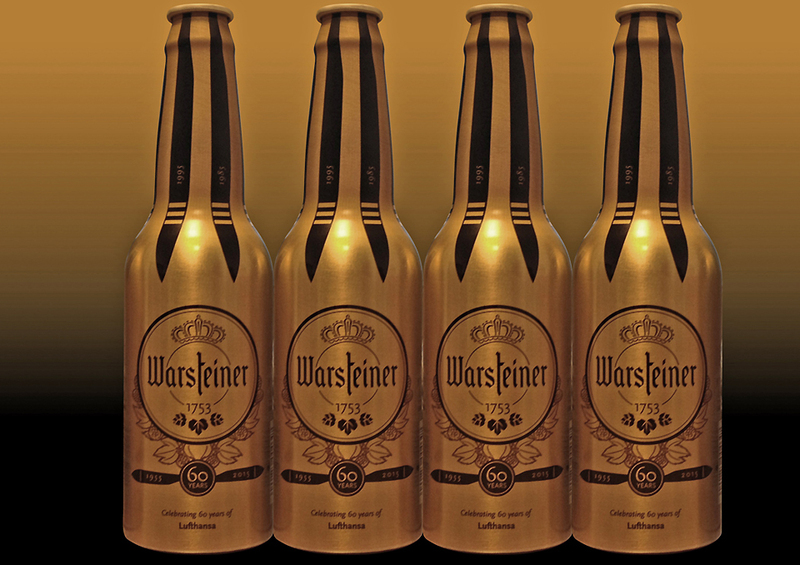 I chose what I thought would go best with the beef curry – a crisp Pilsner and could go past the legendary Warsteiner. The Warsteiner and Lufthansa partnership is still going strong. My seat was front row and the fold-out monitor has a large screen with a easy to use entertainment interface. No noise cancelling headphones but the quality of the hardware was good and did well to cut back the gentle hym of A380. The IFE is packed with entertainment options including live TV for news channels. This was great as never before I could have imagined watching the third presidential debate while cruising at 40,000 feet. I watched the debate live on CNN and the streaming and reception was great. The signal broke off a couple of times which is understandable as its satellite driven but I watched the whole debate in the comfort of my seat. For people who prefer to catch up on work, the aircraft is powered by satellite Wifi was good speed. 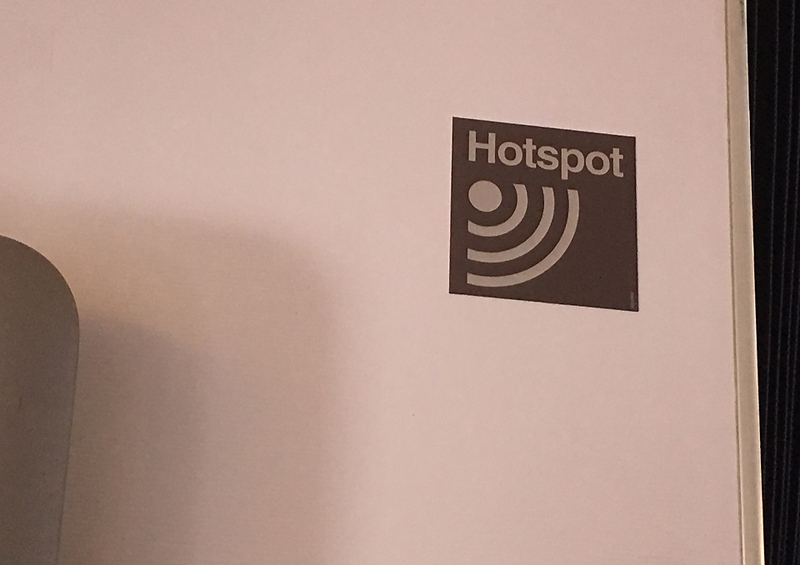 There is a charge to use internet on the flight and for our flight was EUR 19.99 for the duration of the flight. The movie choices were somewhat limited as were the international selections but overall a good mix to keep busy on a transoceanic flight. The service on-board the flight was impeccable. The flight attendants were smart, informed and attentive with an excellent service ethic. 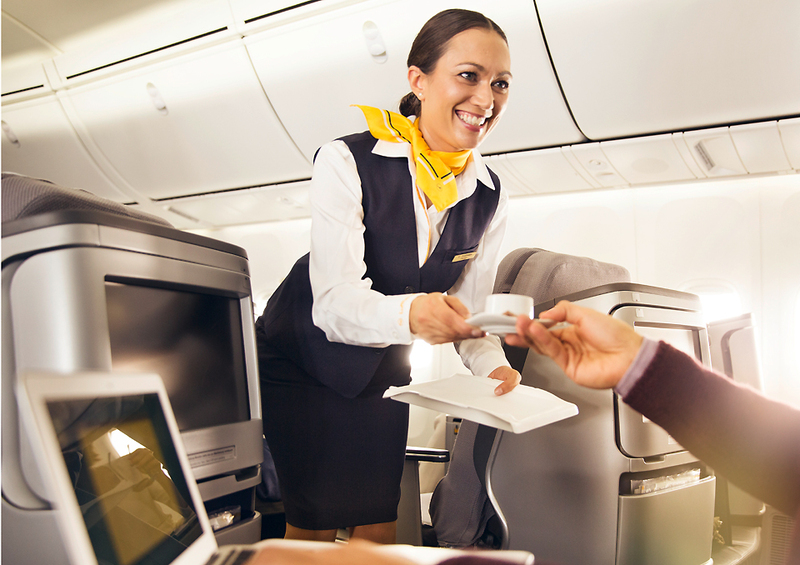 The consistency was par-excellence and this is synonymous with great German service that Lufthansa takes pride in. Overall an excellent flight and great value. 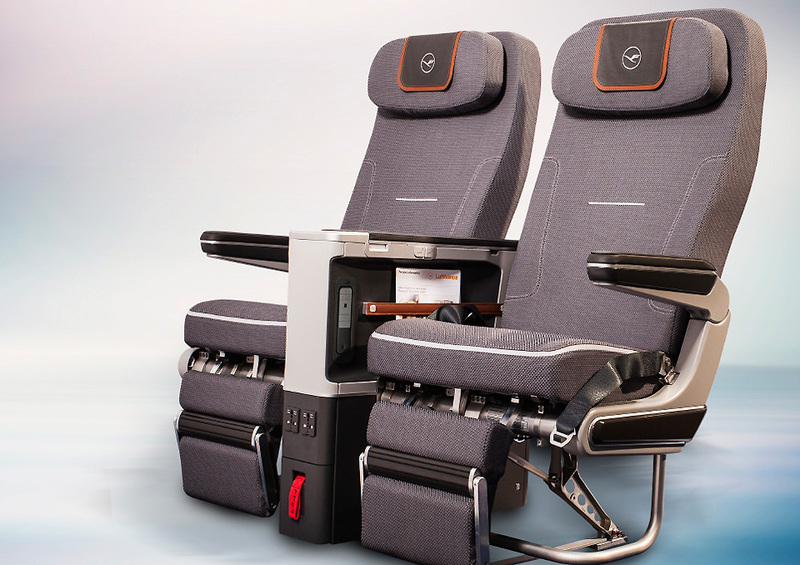 The prize point of the Lufthansa is the seat and this is exceptionally good value for what its worth. 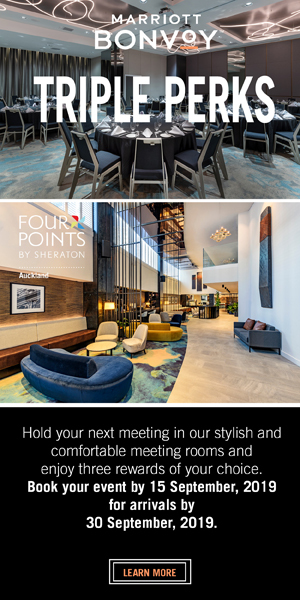 The comfort and the difference is tangible and it is great way to travel for the budget conscious business traveller. 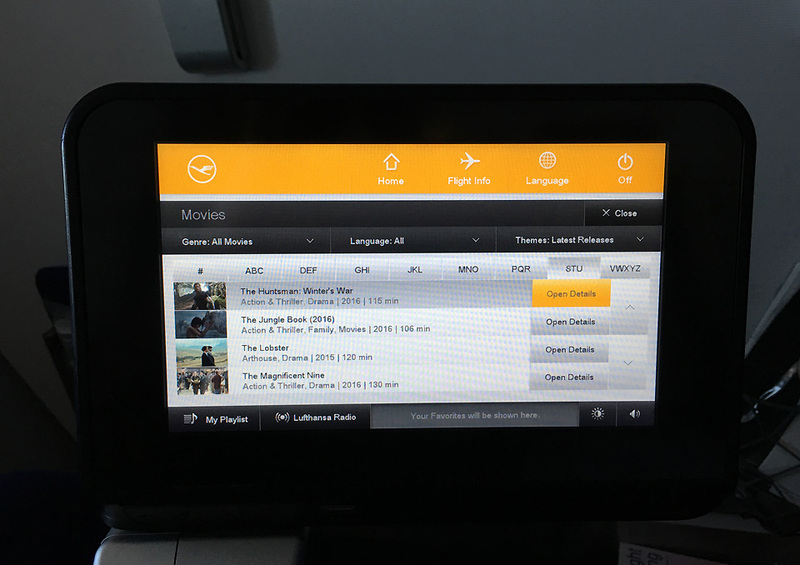 What’s better is that Lufthansa offers this service across all of its wide-bodied jets that makes it easier to book it through any stop over point connecting out of New Zealand. Harmeet Sehgal travelled as a guest of Lufthansa.